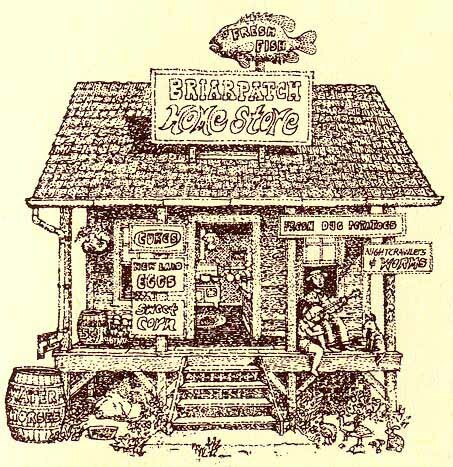 The Briarpatch was a network of businesses in the San Francisco Bay Area founded by Michael Phillips in 1974. Over 1,000 businesses were members in its first ten years. You are a briar if you are in business to: learn about the world, because you love business and you want to serve others. Briars believe in helping each other, sharing business know how and being open with financial records. Richard Raymond, who was already using the names Briar and Briarpatch; founder of the Portola Institute. Andy (Bahauddin) Alpine: first Briarpatch coordinator and founder of Common Ground Quarterly. Everyone agreed to contribute to Andy's first six months' expenses to help the Briarpatch businesses until there were sufficient funds to cover his living costs. That took less than six months and $600. At its peak in 1977, the Briarpatch had over 600 active, paying members. In the first three years, the Briarpatch published an irregular color quarterly, with Annie Styron as editor and Tom Hargadon as publisher. The complete collection was published in a black & white book: The Briarpatch Book, Experiences in Right Livelihood and Simple Living from the Briarpatch Community, 1978, New Glide/Reed,ISBN 0-912078-60-X. Other books to come out of the Briarpatch were: Honest Business, Phillips & Rasberry; Marketing Without Advertising Phillips & Rasberry and Running a One Person Business Whitmyer, Rasberry & Phillips. Briarpatch businesses asked for consultationts on occasion; all visits were to the business premises on Wednesdays. The consultants included: Phillips, all the coordinators, Roger Pritchard (the longest and most constitent member, Sara Alexander, Paul Terry and Salli Rasberry. From 1981 until 1986 a business school was affiliated with the Briarpatch. The Noren Institute ("Hands-on Business Learning") included mostly Briarpatch members as students and teachers. Classes were taught by taking students, in a van to study exemplar Briarpatch businesses. Noren had approximately 400 students over its five year life. Marketing Without Advertising and Running a One Person Business were among the classes offerred by Noren. The classes were the source material for two books with the same titles. The Briarpatch never successfully grew anywhere outside the Bay Area, although efforts were made in Kyoto, Tokyo, Stockholm, Western England, Paris, Lyon and Seattle. A structure similar to the Briarpatch was developed with a government template in Sweden, copied in Germany and France and re-transmitted to the Mid-West of the U.S. by the German Marshall Plan Fund using the name Small Business Marketing Networks. Well known businesses that were in the Briarpatch: Harvey Milk's Camera shop, Kaisek Wong's design business, the original store that created The Body Shop, Palo Alto Computer Learning Center where Steve Jobs met Steve Wozniak, Nolo Press, Greens Restaurant, Tassajara Bakery, Berkeley's Buttercup Bakery (the first commercial business to serve the bread and food which was later credited to Alice Waters as "California Cusine"), Margo St. James' Coyote (the prostitutes union), and Fort Mason, the first urban National Park facility (founded by Ann Howell). *Whitmyer and I had a fight over the book Running a One Person Business. He responded by excluding me from his excellent version of the Briarpatch history. I created and ran the Briarpatch. None of the founding sponsors (Raymond, Buchdruker, Silk, Alpine etc) knew each other. They all knew me and came to help when I asked them to. I led all consulting teams and did all the consulting. Others came along as apprentices. The Briarpatch Review was started and run out of my office at Glide Church by Annie and me. We were lovers during the two years that the Review was first published.